Her slogan is posted in the Club's locker room. "Aim for National Championship. Belief is Might." 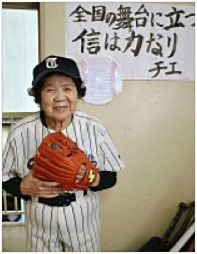 Chie Kaminakabeppu (83), uniform number 12 of Takatsu Municipal Evening High School's Baseball Club, started on the bench for the first time on May 21 and her team advances to the Regional Championship of Kanagawa Prefecture in June. In her primary school days, Ms. Kaminakabeppu did not have time to study owing to the war. When she was 76, she went to Junior High at night to learn English and carried on to High School in 2010. Chie-san joins the Club's practice 3 times a week for an hour from 9 p.m. and inspires other players. Although her usual job during the games is to convey manager's messages to the players, she played briefly left field on the fifth on May 21 as her team was leading 11-1. She enjoyed it but says the excitement may have shortened her life by 3 years.